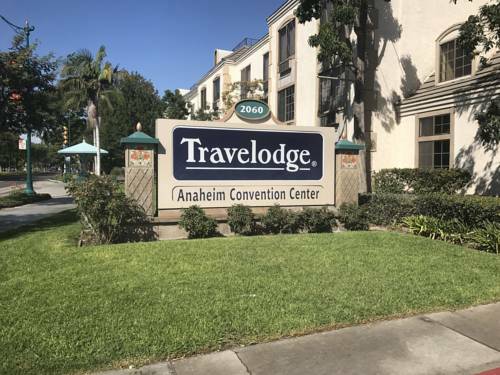 Travelodge Anaheim Convention Center hotel near Disneyland is the perfect place to start your adventures in California. Tickets Available at front desk for Disneyland, Disney California Adventure Park, Universal Studios and Sea World Disneyland Park and only 2 Blocks away. Anaheim Convention Center - 1 Block, Complimentary Continental Breakfast, Free Wireless High Speed Internet Access, Outdoor heated pool, Coffee Makers, and Hairdryers in all rooms, Self-service laundry facility, Sightseeing Tour Desk, Angel Stadium and Arrowhead Pond - 3 Miles,15 minutes from Knotts Berry Farm,25 minutes from Newport Beach, limited parking, compact vehicles only, a nominal fee applies for each additional vehicle.